Rated 5 out of 5 by MsReddFox from This one's for me! I play games for relaxation and entertainment, and I love this game. Every thing about it. Graphics are great, good story line, and I love there's a map that you can go from place to place. You find gems in each scene to access the maps. Having no map, with a LOT of backtracking, has stopped me from buying otherwise good games. I wish all game creators would put maps in their games. I really liked the things you can do in this game...plant a garden,collect veggies, plant flowers, mix potions, very interactive with things you can do. This is one game I will play many times. Of all my games, this is one of my favorites. I hope there's a sequel in the near future. Rated 5 out of 5 by blazingbutterfly from Great Game!! I truly enoyed playing "A Gypsy's Tale" cant wait for the sequal to come out!!! Rated 5 out of 5 by Boomer1097 from Enjoyable Game This was a fun game. You've been summoned to free the girl trapped in the tower surrounded by a dark forest. You travel through the areas surrounding the tower by playing HOS and some mini games, collecting crystals and talking to gnomes. The map was very useful and allowed you to easily move around. There is a twist towards the end, which was fun. The way some of the characters were drawn cracked me up....they weren't bad, just entertaining. The HOS are not junk piles, you have to locate and collect certain things to obtain an item. Some of the things were hard to find, but the hint button was helpful. The hint button was not good if you got stuck. I did have to refer to the walkthrough towards the end of the game. Overall, this was a fun game and had a nice ending. Rated 5 out of 5 by grandmagin from Wonderful Game I've played this game 3X's and am still waiting for the sequel. Any word on when it'll come out?? Rated 5 out of 5 by citygirlretired from Re-Doing my review of this game - + + I was having difficulty -discovered it was my visual problems and the game was fine - be advised, some of the sought items are rather small but they are there, a few of the contact points are small - but they are there and are necessary to finish the game ... don't give up ... it's a lot of fun. This is not one of those Done in an Hour games... so grab a cold drink and enjoy.... BTW.... my grandson is 9, nothing that would frighten him. Rated 5 out of 5 by rosekaufmann from Beautiful, Challenging, and Pleasant Completed in casual mode. Good length. Challenging; requires some thought. Many, many tasks to do in this adventure-HOG game. Visual effects are beautiful. Relaxing play - music changes to suit scenes. Has circles showing what items you need to find and put into the circles to get an object (don’t recall what that type is called). You can’t take items until they are needed. The gnome, goblin, deer and fairies were terrific. I especially liked the challenge of making and using some of the potions. Unless you need a lot of exercise, find the crystals in every scene because they will unlock a piece of the interactive map. Puzzles are middle-of-the-road – most aren’t too easy but not too difficult. If you don’t know what to do or where to go, check your task bar. If that’s not enough help, there is a hint system, but it isn’t the most helpful. It might be easier to just revisit rooms and click the hint button. Looks like there will be a sequel, but I haven’t seen one yet. About a 4.6 stars (because I got stuck a few times), so I rounded up because it was just a beautiful and pleasant game to play. Rated 5 out of 5 by Tracy_lynn from A different HO game Very well done, the graphics were cute, made me think of a picture book. The puzzles weren't to hard and I like how they did the HO scenes differently. Fun to play. Rated 5 out of 5 by Emerald_Storm from Dreamlike-Storybook Adventure Game! The graphics for this game are astounding - they give the feel of a heavy, dreamlike fairytale to set the mood. Challenge level was just right for me: Plenty to twist my brain without driving me mad, beautiful scenes to search for things without making me go blind, but none of it so easy that I became bored. The developers obviously put a great deal of thought into the layout of the game - everything is very intricately woven, leading you to most of the things you need in a logical fashion. Hint system was just right; recharged in an adequate time frame, but wasn't too fast. MOST games that I play disappoint me because I'm more of an adventure gamer, and it seems that a great many HOG's with a storyline are listed as adventure games. This game isn't like that. There are indeed plenty of HOS's in the game, but the adventure of looking for things kept the momentum of the game moving forward in just the right way. Rated 5 out of 5 by purplegmimi from May Fav Game! I love this game! I played it on my mom's i pad which made me feel like was actually in the game. 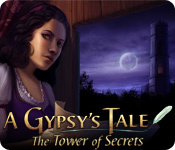 If you are looking for a fun, thought provoking and visual appealing game then you need to play A Gypsy's Tale. Rated 5 out of 5 by OldLady12 from Excellent Game! Purchased this game a while ago and are playing it again. It is a lot of fun, with many things to do and some great challenges. By collecting jewels in each scene, you can get parts to a map that is interactive so you can jump from scene to scene. Some of the puzzles are difficult, but not frustrating. You need to actually think in some of the scenes to decide what needs to be done to advance in the adventure. The graphics are amazing and the story is great! I would recommend this game for both children & adults. Rated 5 out of 5 by cdminot from Call Me Crazy, But 1 of My Faves! I have played this game over and over, and every time I play, love it even more! It has a great story line, and while I am not a fan of the circle hos, at least you're looking for things that pertain to the story. A gypsy is to break the curse, not a new story, but this one leads you from one place to another, although, when you find all the jewels and the items you need,the locations get added to your map, and you can use that to jump around with, which I like, as I absolutely despise retracing my steps. Of course, you're object is to defeat the evil Sorceress, and have a happily ever after - and I do wish they would put out another one of these games w/the gypsy investigator! This is one of my standby faves to play when I am bored with everything else, and definitely feel I got my money's worth since I played it more than once! Rated 5 out of 5 by tmbm70195 from Nice change from some other games! A decent challenge and nice change on the puzzles. Rated 5 out of 5 by Hookedonbigfish from A very good and enjoyable game In four words - interesting, entertaining, inspiring, intriguing can best describe this game. The graphics were very good and clear and the dialogue was interisting and topical. The puzzles were not too dificult but a few needed some extra thought. 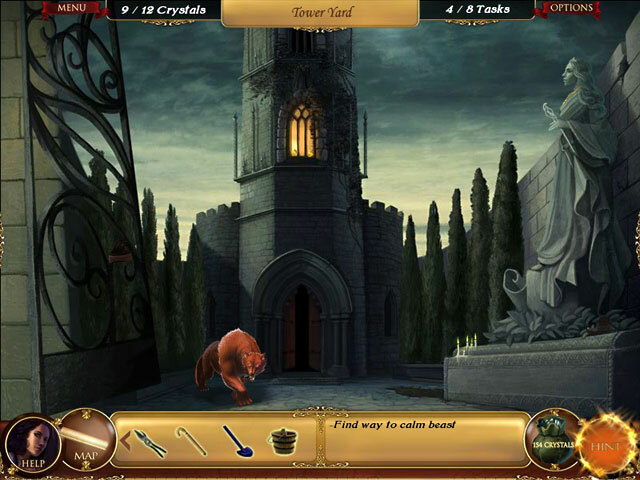 The hidden objects being fragmented did not distract from the intrigue of this game although some were a tad hard to find as they melded into the background. There was quite a lot of moving around and backtracking but I feel that this added to the interest and inspiration on finally being successful in that particular task. You really had to remember what was contained in each scene as most of the items and implements would be needed later in the game. Truly challenging in some places with the walkthrough blog needed but overall a great game, well worth the money. Rated 5 out of 5 by whitewave1 from Surprisingly Good! Initially, I didn't think I was even going to play this game once I started it. It's not the traditional HOG. But, once I got into it, I was hooked! It's very challenging and makes you think and remember different locations within the game. Quite a surprise. Given how much effort the developers put into the game, they could have given a little more to the story line, but it's okay. Would recommend this to anyone who likes a little challenge. Rated 5 out of 5 by andreacole70 from Loved it and waiting for the sequel I have played this game three times now. It is beautifully drawn with a different twist on seek and find. I am getting really tired of the usual hidden objects games and this was a nice change. It has been out quite a while but have not heard of a sequel in the making. The story ends as a partial cliffhanger with an understanding that another game will come along. I have researched it a little and found no information regarding a part 2. This was an easy game that can be accomplished in 3 to 5 hours. There were a few puzzles but nothing to stump you too much. Hope you enjoy it as much as I did. Developers, please come out with a sequel. Quite a few of us are biting at the bit. Rated 5 out of 5 by hodgepodgespv from one of the first games i purchased and while i was newer than green grass, i had fun playing the game and following the story. i did finish this game with a struggle, but like i said, this was one my first games! i know i will play this one again...probably with much more ease now. the art work was lovely with a sound track that does not make you want to scream. Rated 5 out of 5 by pses from Great adventure/hidden object game! 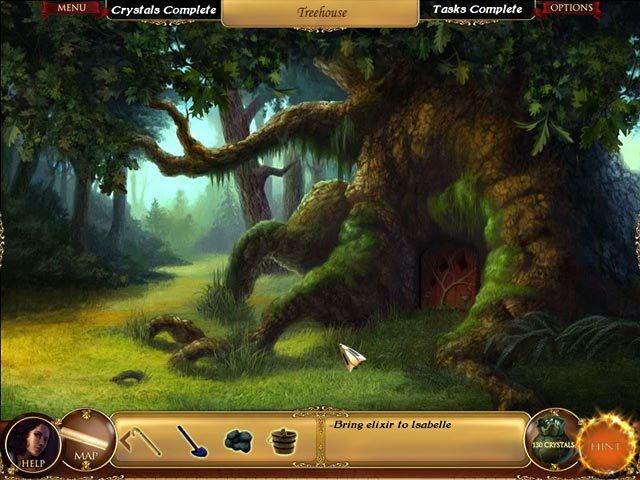 This charming hidden object/adventure game is a good family game! More simplistic than other games of this genre, however, very well done. Lot of challenges, lots of puzzles. Would be good for kids to adults seeking fun game! Rated 5 out of 5 by zoomzoomZombie from A Charming Game A Gypsy's Tale: The Tower of Secrets is a fun hidden object adventure game. The graphics are beautifully drawn, the characters are fun, and the story is engaging. There are no junk pile scenes to dig through. All the hidden object scenes have items that are hidden into the scenery. The puzzles are fun. There is a store where you can trade the crystals you find for items that will help you with your quests. I really like the fairy/gypsy theme. Rated 5 out of 5 by Brendym from Fun hidden object game I loved this game. The visuals were great and I hope a sequel is forthcoming. Rated 5 out of 5 by VelvetMoonlight from Fantastic game! I played the trial and was so impressed I decided to buy it straight away! It is a beautiful game with lovely dreamlike graphics. The storyline and music are both very good. The hidden object games take a different approach than the norm, which I enjoyed. The puzzles are good, with a mixture of both hard and easy, and a handy skip button for the games that were frustrating! Overall a very enjoyable game ! Rated 5 out of 5 by Macaroo from Family Fun. An excellent game for sharing with kids and for casual adult gamers just looking for a relaxing, uncomplicated pastime. The puzzles aren't terribly challenging, but on the plus side, they're not frustrating either; perfect for first-timers and young to pre-teen children. The storyline is engaging and the graphics are crisp and appealing. You'll probably want to use the walkthrough a few times because it's not always clear what you're supposed to be doing or where, but IMO it's not a significant drawback. Well worth the price. Rated 5 out of 5 by NRChi149 from Great game! I really loved this game and hope there will come a sequel very soon! Rated 5 out of 5 by FORTUNATUS from WONDERFUL GAME This game was reminiscent of some of the older adventure game genres that certainly are completely competitive with the best of todays adventures. The game learning curve may be a bit off putting at first but once you get into the flow of the game, it is simply the best best game ever!! The artwork and general storyline is magical, interesting and just pure joy to play. Check it out.... bet you will love it too!!!! Rated 4 out of 5 by zuliker from A Fun, Whimsical Game! This is a bit different than other HOAs. You find just a handful of items to make useful objects become available. The graphics are colorful and detailed and the music is soothing. It's a pretty fun game with a heavy 'fairy tale' influence. When it was done, I was looking forward to a sequel, but have yet to see one. Hope the devs make another! Rated 4 out of 5 by stretchmymind from Break the curse! This game is a fun variation of an HO game. You are a gypsy who is supposed to break the curse and save everyone, etc. Not an unknown story line just different characters. There aren't levels of play. There is a map but you have to find crystals in each scene in order to get that portion of the map. The map allows you to jump from place to place which is a time saver. The crystals aren't terrible hard to find and if you get stumped, they sparkle eventually. The bottom right of the screen gives you list of tasks that you must accomplish which is helpful. There is a hint button and you can skip the mini games if you wish but they are fun and quite doable. The HO variation is that in when you click on something that has gears up pops a wheel like object and you have to find all the objects pictured there. The things are sometimes very obvious and sometimes well hidden (including inside things) but never covered up by the graphics. The graphics are simple and nice and clean. There isn't any background music to annoy but there are some sound effects that add to the game. An annoying thing is that when "dialogue" appears on the screen, you have to click on it to make it disappear and then you have to click on the object you want to manipulate. Doesn't help my carpel tunnel. Enjoyable. Rated 4 out of 5 by pennmom36 from The Tower Of Secrets This is kind of a hard game to describe, it's different. In each scene there are a number of tasks at hand. You need to find hidden crystals in each scene in order to earn pieces of your map which will then allow you to jump quickly between scenes. There are several groups of hidden items for instance, you might need to find a rake, a hoe, and a spade, a picture of the items will show up in a circle and you need to find all of the items before you can add that item to your inventory. The graphics were basic and plain but all in all it is a nice and relaxing game, enjoy! Rated 4 out of 5 by tesamoine from Fun Adventure Lite Game I just found this game, and totally enjoyed it. It is not a cookie-cutter HOS game. It is an adventure (lite) game, perfect for those who would like to try out this genre of game. The graphics are beautiful. No voice overs, just forest background noises. It is a great game to relax while playing, although it is not very easy. You will need to think. Puzzles I encountered were on the easy side. I highly recommend this for one who wants to veer away from typical HOS games and delve into the world of adventure. Rated 4 out of 5 by centauri272 from A different kind of game! This is not a typical HOG since the objects to find are in the location. There is only one game mode. You have a list of objectives. There is a map; only if you find a number of crystals in a location will you be able to jump to it with the map. 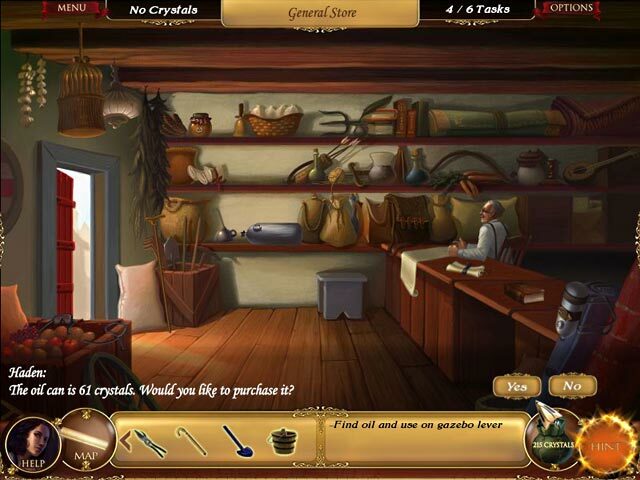 The crystals allow you also to buy some objects in a shop. The graphics are clear. The mini-games are interesting and on the easy side. If you don't know where to go next, then the hint system is useless... "Try a different location", yeah yeah, I know... Otherwise, it is ok. The game is quite short; it took me a bit more than 1 1/2 hours to finish. Nevertheless, it's quite entertaining and relaxing. Rated 4 out of 5 by Donnalda from Charming I loved playing this game. The puzzles were challenging and fun. The graphics are beautiful. The story line includes some surprises. I highly recommend this game.